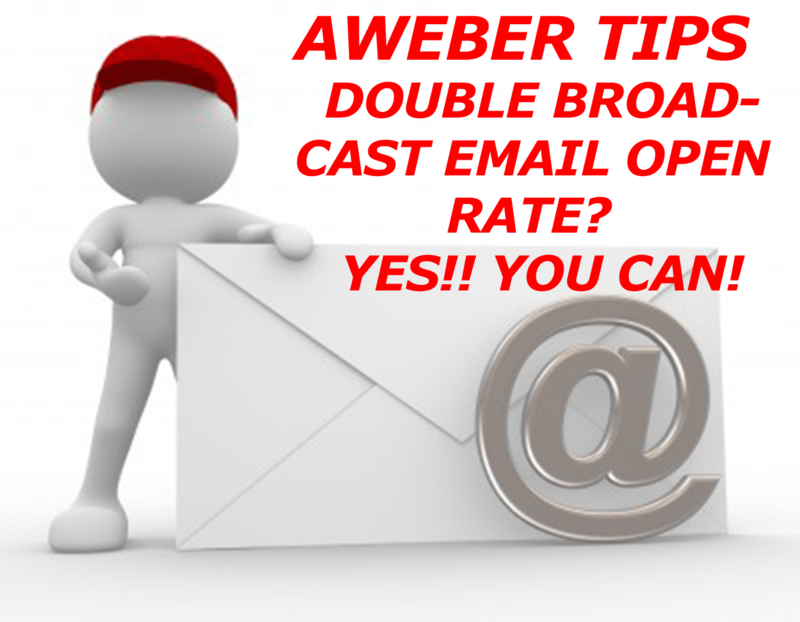 “Double Broadcast Email Open Rate” sounds like a pretty lofty goal, but using this AWeber tip, you CAN almost double broadcast emails open rates very easily by using a list segmentation technique. List segmentation seems like an advanced topic to many. 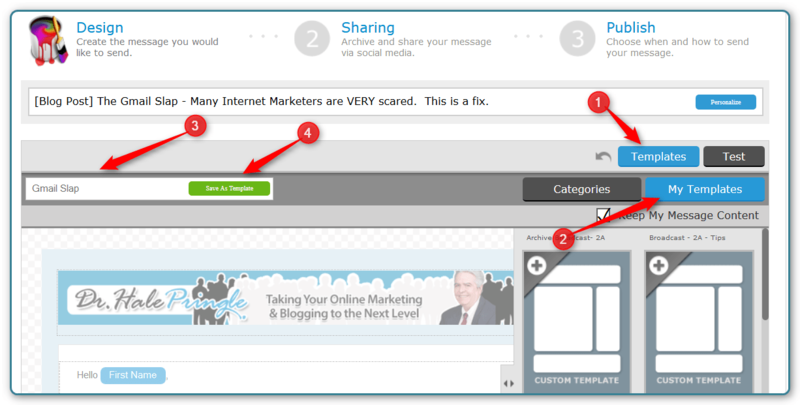 What I am describing in this AWeber Tip is a simple (and FAST) list segmentation technique that anyone can use to (almost) double broadcast email open rates. In this AWeber Tip, we are going to do is resend a broadcast, but only send it to subscribers who did not open the email the first time it was sent out. Here is an example: If you had a 20% open rate for the first email, you very likely will have about 20% for the second. Since you are only sending to the 80% who did not open the first email, you will achieve a 36% total open rate if both emails stay at around 20% opens. 36% is a lot better that 20% and it is easy to do. The one thing that AWeber did not do was make it easy to send exactly the same email. We are going to get around that by using our broadcast email and making it into a template. The first step is to find the Broadcast email you want to send, click on the “Copy” link under its name and create a template using that email. One you save this email, you are going to have a draft broadcast waiting in your list. Delete it. Subscribers Who Did NOT Open the Email. 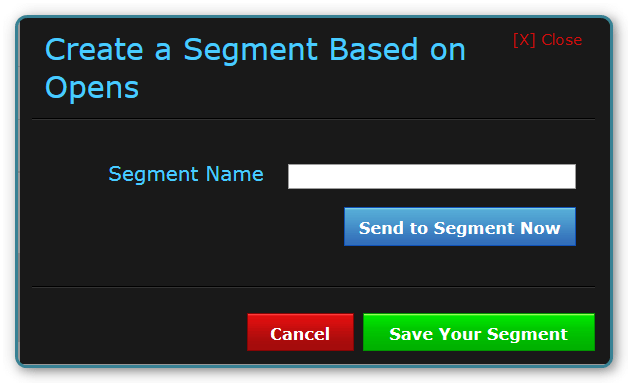 Here we are going to choose the Blue “Send to Segment Now” button. An Empty Email will show up. Fill it using the template you just created. Again the steps are 1) Click on Templates, 2) click on My Templates, 3) make sure the “Keep my Message Content” box is NOT checked, 4) Click on the Template name you just created and 5) Click the APPLY Button bellow the templates. There are two remaining things to do. Consider changing the Subject line. There are two schools of thought. A) totally change it – maybe people weren’t attracted to that headline or B) add “RE:” or “Resend:” to the beginning of the subject line. The B) option has the advantage of telling the subscribers that the message has been sent before if he or she starts going through all of their unopened emails for the last couple of days. The A) option has the advantage of maybe hooking the interest of someone who bypassed the first message because they weren’t interested in the subject you presented. It is you choice which to use. Time to Send the Broadcast. It is good to send it something like 18 hours or 35 hours after the first emails. It is possible that some of the subscribers are very busy at certain times of the day and if you hit that busy time with your first email and send your second email at the same time, you will likely hit the busy time again. Send the second one at a different time. NOTE: You can only use this technique on one list at a time. If you sent the original broadcast to several lists (for example List A and List B) at one time, AWeber will automatically remove the duplicates. If you use this technique on List A and then on List B, AWeber would not check for duplicates and anyone on both lists would get two copies of the same email. So as I said in the beginning, if you got 20% open rate on the first email, there is a VERY good chance that your will get around 20% open rate on the second email as well. Of course, the list you are sending the email to is 20% smaller than it was the first time, but you have still upped your original 20% to something like 36%. You would come close to our goal of double broadcast open rate. And all this without crafting a new email and in less than 5 minutes. 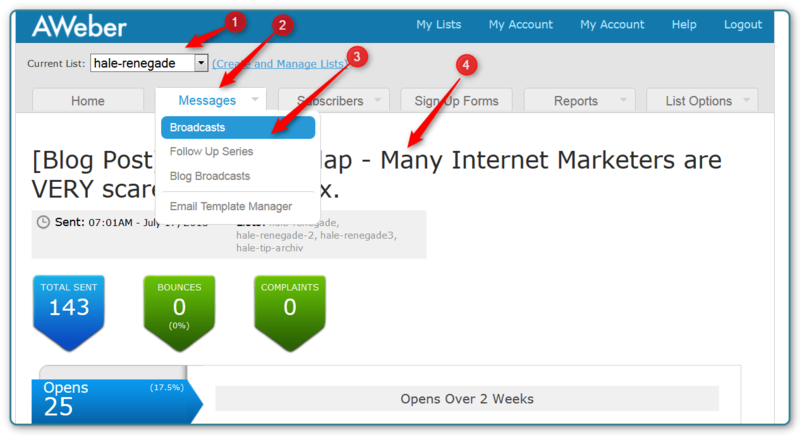 “Double broadcast email open rate?” YES you can, with just a few minutes work. P.S. If you are working to move your business online and it all seems overwhelming, I can help! Take a look at http://HalePringle.com, or sign up for the free coaching call. You can email me or give me a Skype call. 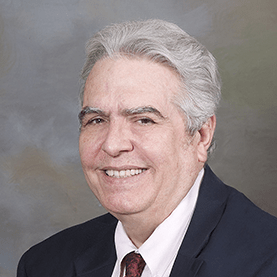 I’ll give you the benefit of my years of experience and many thousands of dollars in training and searching the rabbit hole called Internet Marketing and Network Marketing. 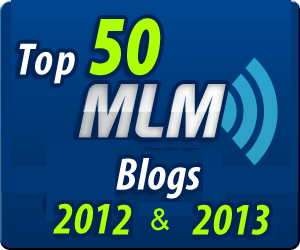 I can help you with Lead Generation, the feeling of overwhelm, blogging, and even career change. Add that to the finest mentoring on the Internet (Ann Sieg’s Team and Inner Circle) and you have a Winner! Hale, Thanks for taking the time to share this. You are most welcome Rich. It always seems like a waste when I spend time figuring out something that many people need and then not sharing it. Hello Dr. Hale,Its been a while!! I found your post through Google.I just wanted to add something about resending the broad cast to the new segment. Probably a shorter route… After naming your new segment of people who didnt open, instead of "clicking send directly to this segment" you save and go back to the original broadcast, click "Copy" then go "next" upto the page with the sending options.Remove send to "all subscribers" and select your new subscriber segment list and hit "save message".That's what I do.Thanks for sharing this valuable information, Ruthida.